When I stepped back and looked at my progress yesterday, I noticed that the shadows in the towel were pretty cool. I want to warm them up a little! I used a VERY wet wash of Burnt Sienna and glazed it over some (not all) of the shadow areas in the towel. 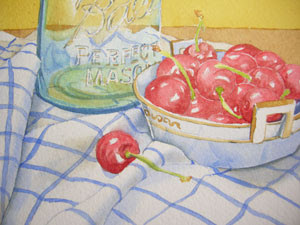 This very light wash, like a tea stain, helps to warm up the shadows and make them look more natural. 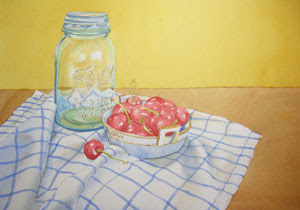 I added a touch of this color to the left side of the glass dish also, to help define the shape and shadows, and to add a tiny bit of reflection where the cherry on the table is shining into the side of the dish.